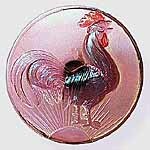 Unlike most Carnival shapes, there is little known about the provenance of hatpins. Some are found marked with the word “Geschutzt,” believed to means protected or patented in German. Czechoslovakia is also believed to have been the origin for many. Shown below are the more common patterns. Basketweave. Currently selling in the $50 to $80 range. Belle. $115, $230 (both 2006), $175 (2007), $130 (2012), $185 (2013) Big Butterfly, also called Egyptian Butterfly. One of the most common. $25 to $40. Border Path. Often called Squares and Triangles: $35 (2007), $75 (2011), $50 (2013), $55 (2014). Butler's Mirror. Some call it Greek Key because of the pattern around the edge. $30 to $50 range. Coolie Hat. When viewed from the side these look like the shapes of the traditional Chinese hats. $30 to $50. Dimples and Brilliants. 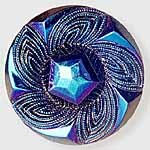 A dark dimpled center surrounded by rhinestones: $55 (2007), $55 (2011), $40 (2012). Dogwood. 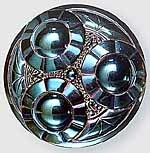 There are several similar designs called Dogwood. This one has gold decoration: $35 (2007), $95 (2010), $190 (2014). Dragonflies. An intriguing design but very common. Sell for between $30 and $60. Elegance. There are two sizes, the largest 1 5/8 inch diameter. $70 (2010), $45 (2012), $100 (2014). Embroidered Circles. Named for the circular rings: $90 (2003), $95 (2006), $140 (2014). Faceted Dome. Average availability, desirability. Two sold for $15 and $30 in 2012. 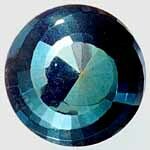 Faceted Oval. Rather simple design; one sold for $45 in 2003, another for $75 in 2006. One listed as milk glass sold in $40 in 2007. Flower Arc. Also called Garden Path. Examples sold for $45 in 2012, $60 in 2013 and $65 in 2014. Flying Bat. 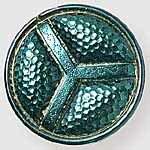 One of the most interesting hatpins with a striking shape: $110, $140, $165, $250 (all 2013). Leaf and Veil. A highly desirable hatpin, these often bring between $600 and $750, but for some reason unknown they will sell for as little as $75. Moire Beetle. 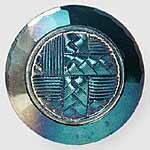 Sometimes called Moire TaffetaMoire is pronounced “mor-ray.” Sell in the $30 to $50 range. Green, $1,100 (1994), $1,200 (2013), Lavender, $900-$1,200, Lime green, $1,600 (2001), Marigold, $2,100 (1995), Purple, $1,100 (2004 & 2012). Known in amber. Penstar. 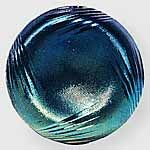 Usually with this attractive blue iridescence. In 2007, one brought $140; in 2014 one sold for $130. Piazza. A rather busy design that brings $225 to $400 at auction. 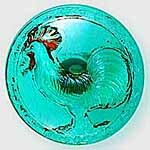 Rooster. Found in a variety of colors and paint themes. 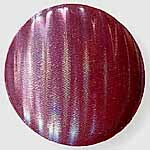 Not all will be iridized. Six Plums. Also known as Cattails. 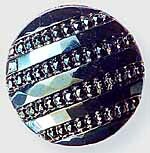 A common pin. Some iridized over all, some iridized on the plums, some on other parts. $25 to $40. Spiral Dance. 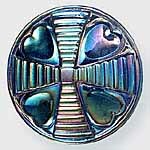 Similar to may other faceted hatpins; this one has the facets arranged in a spiral. They bring $40 to $70. Star Center. Two sizes known. Of questionable age. One sold at live auction in 2012 for $25, one in 2013 for $95, and one in 2014 for $105. Star of David and Baguettes. Not too often seen, $205 (2001), $250 (2003). Strawberry. A desirable pattern usually seen in green. One of these brought $750 in 2003; another $325 in 2006; another for $375 in 2014. Amber sell for $300 to $450. 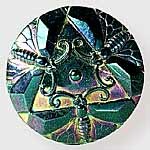 Stylized Scarab. 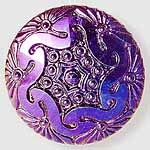 Found in amethyst and green. Either color sells for between $100 and $200. Sunflower. 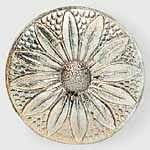 The design looks more like a daisy than a sunflower. It is only known in white and brings from $60 to $80. Sun's Up. A rooster crowing as the sun rises. Found in mostly in lavender for $100 to $200. A purple example sold in 2003 for $350 and another one in 2010 for $100. Throw Pillow. 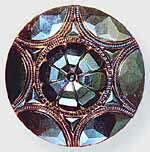 A large indentation in the center. Throw Pillow hatpins sell in the $40 to $60 range. Top O' The Morning. Referred alternately as Pheasant (which is what the bird seems to be). Only known in purple. Sell for $40 to $70. Triad. A good pin for starting a collection. Dark Triad sell for $30 to $50. 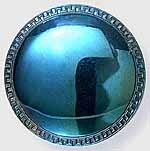 A moonstone example brought $160 in 2012. Tufted Throw Pillow. Readily available and a must for every collection. Sell at auction for between $40 and $60. Turban. 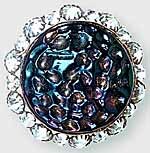 A relatively common hatpin that sell in the $40 to $60 range. Two Flowers. 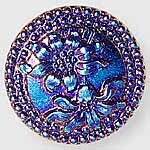 This design is one of several that are called Two Flowers. Usually sell in the $100 to $150 range. Veiling. Sometimes called Veiling and Beads. It usually brings $50 to $90 at auction. 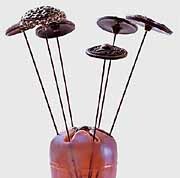 There are many hatpins that are not flat but bulbous and hollow. 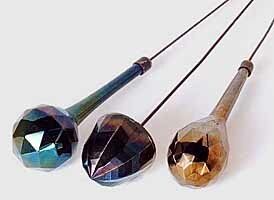 The three shown here are, from the left, Diamond Sphere, Bullet, and Oval Sphere. 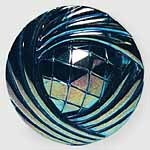 Diamond Sphere sell for between $70 and $120, Bullet for between $50 and $100, and Oval Sphere for between $50 and $80.